However, streaming services differ. In the first part of this article the different services are put in a typology and then the business model of personalised streaming services are analysed to assess their economic potential. Internet or web radios broadcast conventional radio programs online that can be listened without any interactive and/or personalised features. Most of them are free of charge and thus ad-supported. In Germany, market researcher Goldmedia (2012) counted over 3,000 web radios in 2012. 2,470 are just online-based radios, which broadcast mainly music, but also news, sports and other events as well as comedy shows. In addition, there are about 380 online radio stations operated by classical FM radios (simulcaster) with further 150 online sub-brands. Most of them are ad-supported, but the public radios’ online programs are also fee-funded. The online web radio market is highly dynamic. In 2012, 800 programs were closed down whereas 750 were newly established. The web radio market in Germany, thus, slightly shrank by 1 percent for the first time. The number of GEMA licensed web radios decreased by even 17 percent from 1,697 to 1,410 from 2011 to 2012 (Goldmedia 2012). Non-interactive but personalised web radios such as LastFM, Pandora and Apple’s iTunes Radio provide a more innovative concept than conventional online radios. Algorithms help to detect the listeners’ music taste to generate playlists. The playlists can be saved and shared with other users. It is not possible to replay a song. Therefore the program has to be restarted again. These services, thus, are non-interactive, but personalised in its use. The absence of interactivity, therefore, is the main criteria of distinction to music streaming services in the narrower sense that enable a music choice without any restrictions. Hence, full streaming services such as Spotify has to be directly licensed to the owners of the master recordings, whereas for non-interactive webcasters such as US-based Pandora licensing is compulsory and the licensing rate is determined by the Copyright Royalty Board (CRB). Non-interactive services, thus, are mainly ad-supported with supplementary subscription which has not generated a significant amount of money until yet (more about Pandora’s business model can be read later). Interactive streaming services enable the users to choose songs without any restrictions from a vast catalogue of several million titles. They offer different models. In the ad-supported version the consumer gets the music for free. This so-called freemium model is usually limited in time and bandwidth. On Spotify music can be listened for free only in the first six month. After this period free music streaming is limited to ten hours per month. On Deezer the free music consumption is restricted after a year to two hours per month and on Simfy just 30 seconds of a song can be streamed for free after a free trial period of two months. Just Xbox Music offers an unlimited ad-supported freemium model. Some streaming services such as Rara, Musicload and Google’s All Access offer exclusively subscription models without any freemium models. The monthly subscription fees range from EUR 4.99 per month for unlimited but desktop only versions to EUR 9.99 per month for a full premium services with online and mobile access. Therefore, the interactive streaming services rely on a revenue mix of ad-support and subscription. YouTube is by far the best known and widely used video streaming platform. Google Inc. purchased YouTube in November 2006 for US$ 1.65bn. YouTube enables its users to upload their (self-made) videos. Thus, YouTube is a so called user generated content platform. Music videos are a very popular content on YouTube. Since most of them are copyrighted, it is a copyright infringement to upload them. The law suits by Viacom and the dispute with German collecting society GEMA on royalty payments are still pending in this respect. YouTube, however, recently offers subscription channels to content creators to benefit not only from monthly fees but also from revenues of premium advertising. In addition, YouTube also shares the advertising revenue from its freemium model with the right holders. Video streaming sites such as Hulu, Vevo and Tape.tv operate a different business model. Their platforms offer no user generated content, but streams of licensed music videos. Most of them a pure ad-supported. enable the users to upload their music files on a server in the so-called cloud to stream then the music from any device. The most popular cloud-based music services are Amazon’s “Cloud Drive” with the “Cloud Player”, Google’s “Play Music” (formerly “Music Beta”) und Apple’s “iCloud” with “iTunes Match”. The companies offer a limited free upload capacity, but beyond that the users have to pay for further gigabytes. In Amazon’s “Cloud Drive” 5 GB of storage capacity is available for free. Then the user has to pay US$ 1 for an additional gigabyte. “iTunes Match” users have to pay for the scan-and-match-service US$ 24,99 per year. For further details on cloud-based music services please read the blog entry “There Is Music in the Cloud”. As pointed out earlier we can distinguish between two different types of personalised music streaming services – interactive ones such as Spotify and non-interactive ones such as Pandora. The difference is not just a question of userbility, but affects also the services’ revenue models. Non-interactive services mainly rely on advertising revenue and have only recently established subscription models. In contrast, interactive service have launched freemium models and subscription models side by side from the beginning to convince as many of their users to convert from the free and ad-supported model to the subscription model. Content acquisition is another essential difference between the two services. In the U.S., non-interactive services such as Pandora are treated as webcaster that use the music content on the basis of statutory licensing. Therefore, they have to pay for mechanical rights the compulsory rates of the U.S. Copyright Royalty Board (CRB). Currently the rate per non-subscription stream is US$ 0,00120 and per subscription stream US$ 0,00220. Figure 1: The royalty structure applicable for Pandora Media Inc.
We can see (Fig. 1), that the rates Pandora has to pay to digital collecting society SoundExchange are lower than the Copyright Royalty Board rates. The Webcaster Settlement Acts of 2008 and 2009 permits webcasters to negotiate alternative royalty rates directly with SoundExchange. Thus, Pandora has applied the so called “pureplay” rate – because of the “Pureplay Settlement – since 2009. Pandora paid US$ 238.7m of performance rights royalties for the use of sound recordings to SoundExchange in 2012. SoundExchange channelled 50 percent (US$ 119.4m) to the holders of the master rights (typically labels), 45 percent (US$ 107.4m) to the interpreters and 5 percent (US$ 11.9m) to the session musicians. In addition, Pandora has to obtain public performance licenses and to pay performance rights royalties to copyright owners (composers, songwriters and publishers) and their agents respectively. Thus, Pandora paid US$ 18.4m to the collecting societies ASCAP, BMI and SESAC as well as EMI Publishing and Sony/ATV Publishing. 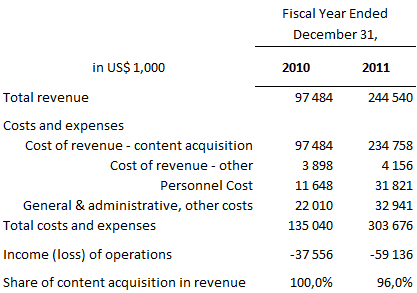 In total, Pandora had to pay US$ 258.7m for content acquisition in 2012. Content acquisition costs, therefore, account for 60.6 percent of the overall revenue of US$ 427.1m. The revenue consists of US$ 375.2m of advertising income (87.8 percent of total revenue) and US$ 51.9m (12.2 percent of total revenue) of subscription fees and other sources. Source: After Pandora (2012: 40) and Pandora (2013: 71). The high proportion of content acquisition costs also explains the operative loss of US$ 37.7m in 2012, despite increasing advertising and subscription revenues (Pandora 2013: 71). In fact, the content acquisition costs grew faster than the total revenue – 67.7 percent compared to 73.2 percent – from 2011 to 2012. The increase in costs is, thus, higher than the growth of listener hours of 72.9 percent in the same period. The number of active users increased 56.1 percent from 29 to 66 million in 2012. This means that content acquisition costs per active user rose in 2012. The crucial factor of Pandora’s business model is, therefore, to control the content acquisition costs with increasing advertising and subscription revenues at the same time. This is urgent, since advertising revenue per thousand listener hours decreased from US$ 33.65 to US$ 29.13 in 2012 (Pandora 2013: 49), which indicates a falling tendency in advertising revenue. Thus, the mobile music segment with smartphones and tablet computers becomes more and more important as well as relationships with automobile manufacturers to integrate Pandora in the car radios. Interactive streaming services have to pay a higher licensing rate per stream than non-interactive ones. According to PrivCo, an U.S.-based financial intelligence service, Spotify’S cost of sales reached 98 percent of the company’s revenue in 2011. If we deduct 3 percent for credit card payment fees, Spotify had to pay US$ 234.8m out of a total revenue of US$ 244.5m to the right holders. PrivCo, thus, concludes that Spotify had to pay nearly all its revenue for music licensing. Other costs for personnel, marketing & sales as well as for overheads, therefore, cannot be paid out of the cash flow. In 2011, this results in a net loss of operations of US$ 59.1m for Spotify AB. Glenn Peoples, Billboard’s chief analyst, counters PrivCo’s assumption that Spotify’s business model is not sustainable by pointing at Spotify’s ability to successfully collect risk capital resulting in cash and cash equivalents of EUR 104.3m (US$ 135m). Further he argues that consolitated financial results does include also high costs for market development, which bias the results. As soon as Spotify would have successfully establish its freemium model in a market it is only a question of time to make them paying subscribers. Spotiy U.K. is, therefore, a good case study. Spotify Ltd. was established in 2008 and was already profitable already in 2011 according to Peoples. In comparing the financial statements of different subsidiaries of Spotify the overall picture is mixed. Spotify AB showed a loss of EUR 33.7m and Spotify (UK) Ltd. of EUR 2.5m in 2011. The Swedish, Norwegian and Spanish branches accomplished small profits in the same year. Since the costs of content acquisition are not broken out in the financial statements, we can only speculate about their negative impact on the financial results. Only for Spotify UK costs of goods sold were reported. Thy accounted for 81 percent of the total revenue in 2011. In 2010, they were even higher with a 102 percentage of the total revenue. Spotify’s costs of content acquisition are, thus, remarkable higher than Pandora’s. Spotify, therefore, has even more pressure to increase advertising and subscription revenues. Thus, it is crucial for interactive streaming services to convert as many freemium users as possible to paying subscribers. According to Midia Consulting, which compared the conversion rate of several services, Spotify and Deezer were much more successful in attracting paying subscribers than Pandora. Although Pandora counted 66m active users in 2012, just a small proportion of 2m or 3 percent were subscribers. In contrast, 32 percent of Spotify’s active users were subscribers and for Deezer this ratio was even 38 percent. Nevertheless the rate of conversion from freemium to subscription models is still too low according to the music industry analyst Mark Mulligan. In his Music Industry Blog Mulligan argues that the gap between freemium and premium services is too wide for most of the services: “Whereas the gap from zero to $0.99 for Angry Birds free to paid is a modest step, from zero to $9.99 for Spotify or Deezer portable is a much more sizeable hurdle. Thus converting to paid for music subscription services is a more sizeable achievement than for low priced gaming apps. More needs to be done to bridge the divide. This can be achieved in through bundles and innovative pricing. Though this must be set against the risk of cannibalizing full price tiers.” (Midia Consulting 2013). 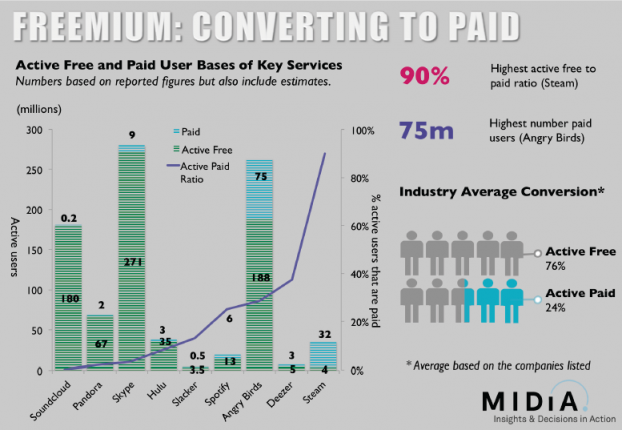 Another problem, according to Mulligan (Midia Consulting 2013), is that freemium models are simply too good for the users to convert to premium models as in Pandora’s case. Therefore, Spotify, Deezer and other interactive music streaming services offer limited freemium models with a lower streaming rate. However, if the quality of the freemium model is considered too low, there is the danger that music fans avoid using the system at all. Thus, it is a thin line of success music streaming services has to walk along. We can identify different music streaming services – web radios, personalised music streaming services, user generated content services and cloud-based music platforms – with a different cost structure especially for content acquisition. The number of registered users is not essential for the economic success of music streaming services. Much more important is the number of active users and the ratio of freemium users and subscribers. An increasing ratio is therefore the main factor of success. The integration of music streaming in automobile radios and the bundling of music streaming with other digital content by ISPs and mobile service providers is maybe the most important precondition for a high market penetration, but no guarantee that the users pay for music streaming. An increasing cost pressure and intensifying competition will result in fewer music streaming services. Just those services will survive that successfully control their costs of content acquisition and increase the number of subscribers. In fact, music streaming will not be the cash cow of music industry – at least not for the streaming services. Billboard.biz, “YouTube Scores Win in Viacom Lawsuit”, April 18, 2013 (accessed May 20, 2013). Billboard.biz, “YouTube Launches Paid Subscription Channels”, May 9, 2013 (accessed May 20, 2013). Goldmedia, 2012, Webradiomonitor 2012 im Auftrag der Bayrischen Landeszentrale für Neue Medien, July 2012. 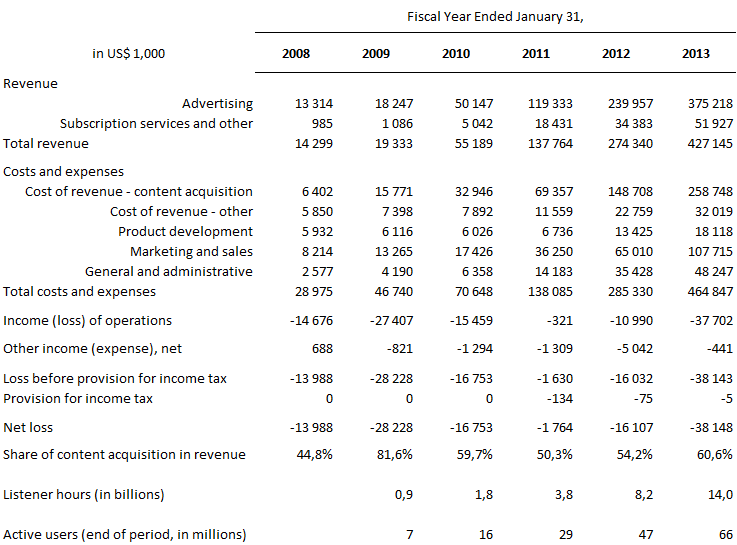 Pandora, 2012, Annual Report for the Fiscal Year ended January 31, 2012. Pandora, 2013, Annual Report for the Fiscal Year ended January 31, 2013. PrivCo, “SPOTIFY’s Just –Closed-Year Financials Obtained”, October 5, 2012 (accessed May 20, 2013). This amount has been calculated on the basis of Pandora’s 2012 annual report, in which it is stated that the payments to ASCAP, BMI, SESAC, EMI and Sony/ATV Publishing for performance rights account for 4.3 percent of the total revenue (Pandora 2013: 24). Billboard.biz, “Business Matters: Spotify UK Shows That Freemium Model is Not ‘Unsustainable’“, October 9, 2012 (accessed May 23, 2013). This post was exactly what i was looking for. You did a great job of breaking down the business model. I want more of this. Thank you. Very useful article. Keeping it on my iPad for future reference. I am currently studying for my MSc in Music and Sound technology and have recently submitted a Critical Analysis coursework based on your publication. I would like to thank you as I thoroughly enjoyed reading and analysing your work and feel it greatly benefited my understanding of the topic in question. I would greatly appreciate any comments or feedback you may have for my work. Dr Peter Tschmuck, Professor for Culture Institutions Studies, University of Music and Performing Arts Vienna, Music Business Research- is streaming the next big thing? – the business models of music streaming services, 2013. This publication is particularly relevant and utile for my research. It is written by a current, well established and authoritative practitioner who holds substantial, relevant accreditations to his name. It is obvious from the format and language that the author has many years of experience from significant industrial research and development. This is apparent from the useful and insightful statistical data and eloquently described qualitative material. Tschmuck’s paper focuses on the most current and increasingly expanding medium of digital media, streaming services. The author depicts numerous examples of key business model topics and provides evidence in the form of financial documentation and further user statistical data. The author argues that the current business models of the majority of streaming services are not sustainable. This assertion is justified by the inclusion of figures within the numerous graphs throughout the publication which depict valuable financial data on a number of the streaming services in question. It is worth noting however, that the arguments are made with the assumption that the business models were not changed throughout the course of their history, nor that they will be evolving the business models for a more worthwhile future. Identifying influential marketing and product service changes such as, the alteration of price tariffs in correlation to the fiscal evidence, and the changes of membership options regarding free listening parameters, would further substantiate the authors argument. My assertion is that the author has not considered that these well known types of marketing and strategical alterations, contribute greatly on the outcome of profit and productivity within any business. The documents are still reliable and useful as they are consistent within the legal framework of the industry, which has remained predominantly static throughout the period of time in question. Whilst further asserting the non sustainable nature of streaming services, the hypothesises demonstrate a potential progression of the online industry. It suggests that a rumour is emerging, in which, global retail giants Amazon, are soon to be launching their own music streaming service and could potentially dominate the industry. Considering this is a crucial statement relating directly to the title of this publication, this argument is unfortunately not verified and no justification is pronounced. This type of generalisation is not featured consistently throughout the authors work. The consequence in this instance is that, he fails to include any detail on the streaming services biggest competitor, in a publication that aims to analyse whether streaming services are ‘the next big thing’. A marginally more detailed description of the current Amazon Cloud Drive also appears under the category of cloud based music services. This time it simply describes the service’s storage and payment thresholds. Constantly reliable with a scholarly standard, the author appears to expect justification of the simplistic nature of this specific description, by including a link to another publication of his, entitled ‘there is music in the cloud 2011’. This publication regarding the cloud services was published two years earlier and does not contain any direct references or affiliations to the arguments raised in the debate involving streaming services. For this reason I do not believe the link serves its purpose in substantiating the assertions in question. This does not correlate to the rest of the text as this misrepresentation of key topics demonstrates a lack of precision. I can assume that the point was initially raised as a variable to the common current argument of global and industrial capitalism enabling corporate giants to monopolise in all markets, which is especially relevant with the increasing demand for technology. Similar to all commercial and consumer based industries the market share holders controlling the majority will continue to increase the disparity between the smaller companies which operate in a highly contested minority market. The fact that these obvious, current and valuable comparisons and analysis’s were overlooked, is suggestive evidence that further research is required in this industry. A further supporting extract to my assertions can be found in the concluding section of, ‘there is music in the cloud’ Dr Peter Tschmuck 2011. Wherein he speculates the current dispute, between the record label and publisher, and the cloud and streaming music services, over licensing issues, that take place in an economically difficult legal system. In the first part of this article the different services are put in a typology and then the business model of personalised streaming services are analysed to assess their economic potential. The publication is precise and well referenced with regards to the topic outlined in the introduction and creates a typology and descriptive analysis of streaming services and their business models. The article initially offers five assertions, each of which describes a current type of streaming service. Throughout this section the publication provides relevant and recognised examples, and describes concisely the similarities and differences between them. “Full streaming services such as Spotify has to be directly licensed to the owners of the master recordings, whereas for non-interactive webcasters such as US-based Pandora licensing is compulsory and the licensing rate is determined by the Copyright Royalty Board (CRB)”. What this extract seems to suggest, in a simplistic manor is that all music distribution must follow the regulations of the legal services, but a key difference between non interactive and interactive platforms is the associated bodies which determine the formula and consequently the amounts and proportions of entitlement, and this is not made clear here. Overall this publication has helped me refine and substantiate my opinions and understanding of not only this current and relevant music industry argument, but also the industry overall. It demonstrates and acknowledges crucial industry issues, and summarises with precision the attitudes of conflicting parties in the debate. There are further questions to be asked with this particular academic publication and further study of new emerging communications would be relevant. As it stands, this author’s credentials enable him to demonstrate asseverations which depict the music industries lack of foresight, in terms of the scale of evolution in the digital and internet industries. Consequently, the author asserts the current stalemate situation between the conflicting industries prerogatives convincingly, with evidence that concludes his case with reason and justification. benefit from containing a strength, weakness, opportunity and threat business analysis, containing more detail on the competitive alternatives to streaming services. Although basic descriptions from consumer perspectives are evident in this publication, it is useful to note that the author does not recognise current viewpoints which link to the relevance, of containing a more reasonable approach and further explanation of the similarities and differences between streaming services. The inclusion of a comparison with companies such as Google owned, Youtube, which are internet majority shareholders, would have further substantiated the reliability of this source as these sources are known to have heavily influenced the evolution of the internet and consequently the music distribution industries. Thank you very much for your well-grounded critical analysis of my blog entry. This helps me to to refine and to revise it for a later publication. Thank you for your kind posting, Ludovic, and you’ve hit the point that Pandora’s US-royalty model is very different from Aupeo’s in Germany. If you follow the links in my blog post you’ll see the difference.